why you should not visit Kasol ? confused! You don’t have to be. Kasol is a village in Parvati valley which is often referred to as mini Israel due to the in-habitation of Israelis in the region. Youth, not only from our country but also from abroad is fascinated about this place but the main question arises that what is so special about this place and why you should not visit it and I am sure you will definitely get your answer at the end of this article. It is a beautiful as well as peaceful village located at a distance of 32kmfrom Bhuntar (nearest airport) in Kullu district of Himachal Pradesh. This village lies adjacent to gurgling Parvati river where you can sit along the river and enjoy the tranquillity and peace offered by nature. The specialty of the place lies in the trekking routes to various places like Malana, Chalaal, Kheerganga etc. Kasol is abode for the trekkers, backpackers and for those who cannot control their adrenaline rush. The cafés in the area offer you world-class cuisines which will definitely make your mouth water. Kasol is what they call is the stoners Paradise or smokers Paradise. It is the relaxing getaway for people coming here. The town hasn’t got monuments or other such sightseeing points but the natural beauty that the heart craves for, is in abundance. You need to walk in order to commute here. But if you wish to go to Malana or Manikaran, you need to hire a taxi or catch a bus. The area is a little remote which makes it an ideal place for relaxing. The place has many hotels, guest houses which one can get at affordable prices. Trout fishing, Camping, trekking are some of the things you can do here. Although you might need to take special permission for the fishing experience. It is considered to be as the best place for angling. There are various interesting, easy as well as difficult treks around this place and Malana. Kheer Ganga is one of the main treks. Kasol is also known to be as the mini Israel of Himachal Pradesh because of the many Israeli inhabitants one can see there. The sign boards of many cafes and restaurants are in Hebrew. The food that you get here is to die for. You have options from Israeli, Italian, Indian cuisines. One should not leave the place before trying the famous food and desserts. Also, one can also try the famous rice beer which is alcohol free. Kasol is a party hotspot. The parties have international DJs and these go on for 2-3 weeks, all day-night long. Manikaran Sahib is only a few kilometers from Kasol. The place is a religious site for Hindus and Sikhs. Shri Guru Nanak ji Gurdwara and the Rama temple attracts a lot of pilgrims throughout the year. The beliefs are different for the different communities. This site also attracts a lot of tourists visiting Kullu Manali and Kasol because of the hot water springs and the religious value it holds. The water of the place is thought to have curative powers and it is so hot that you can cook rice in it. You can also plan your Kheerganga trek from here. It is a village situated at the farther end of the valley and is the last stop of the bus route. It is at height of about 7874ft above sea level. The distance is around 20kms from Kasol. You need to get to Varshaini from where you can either trek your way up to tosh or hire a taxi. Tosh is a beautiful place at the top of a hill with majestic mountains all around. The place is flooded with hippies. The spectacular landscape that you will witness from up there will definitely make your heart skip a beat. You can hire a taxi to get to Malana. But I will recommend you to trek to this place as the trek will offer you some exhilarating scenic views of the snow capped mountains and the gurgling Parvati river. The cultivation of the famous Malana cream makes it very popular. The village is a little isolated from the rest of the world and has its own unique rules and regulations. Kheerganga is a difficult trek of 13 Kms uphill from Varshaini. 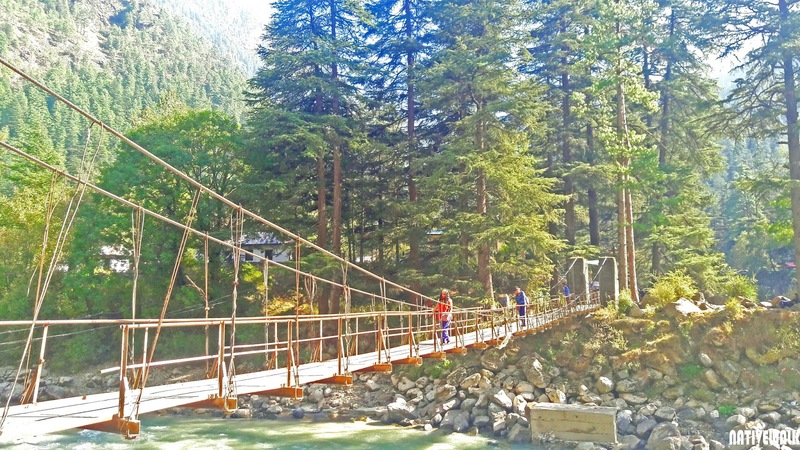 On your way to kheerganga you will cross many bridges and waterfalls. The trek is very famous for it’s rawness and the hot water springs. 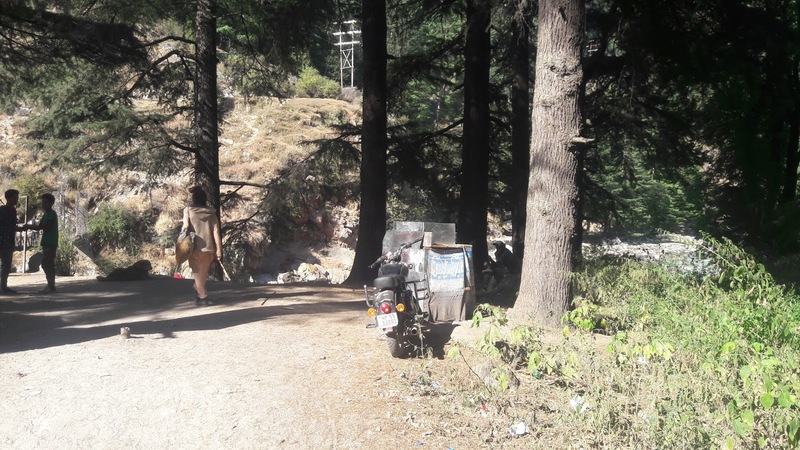 People travel to Kheerganga as it has a temple of Lord Shiva and Goddess Parvati and the holy hot water springs are believed to have healing properties. The panaromic view of the surroundings and the sky from Kheerganga is an absolute delight to the eyes. Kasol is a place which had always been on my wish list. The closeness and the freshness of air which I felt here was something which I have never felt before. When I first landed in Kasol I could barely see few shops and was disappointed by the first sight of the place but later on as I explored the place I could sense there was something mysterious and special about Kasol, watching too many foreigners is not common in India so I was really amazed to observe the crowd that I witnessed. The charm of the place was reflected from the sort of clothes tourists were wearing, colorful and serene was the environment of the place. I wandered here and there in the search of a hotel and finally found one cheap accommodation for myself, I shopped for clothes from the flea market. Bargaining skills can be used here. The market is a “has it all” market for the hippies. It has stuff, from bongs, Bob Marley’s T-shirts, harem pants to all kind of hiking gears and equipment’s. You can buy souvenirs for your families and friends from here. You can also get your hair done with some dreadlocks, colorful lulus or even a Mohawk. The barbers here have some real serious talent. Next I took a power nap and ate in the nearby cafe, made some friends. The few friends that I made told me about the place Chalaal and we went there strolling through the woods. As we approached the village I could hear the loud music in the air and the characteristic smell of the hash. The view that I witnessed was astounding and I couldn’t stop myself from being involved in the aura that the place offered. I had an amazing experience with the people that I barely knew and I still would love to live through that experience over and over again. The night was breathtakingly amazing. After a few hours of fun, I made my way back to my hotel. The next morning I had to head back to my home. But I intend on coming to this place again and again as it has a lot to offer like the many many treks and the secrets that the places has kept hidden from generations are worth knowing. that you might not ever recover from the mindboggling experiences that you will witness there and you might leave your heart there, as I did. Kasol is a small village in the Parvati valley of Himachal Pradesh on the way between Bhuntar to Manikaran. It is one of the most visited hilly destinations in northern India. The picturesque beauty along with the trance and psychedelic parties makes Kasol famous. You can get there from different locations, but to the reach the proper location, the only mode of transportation is road. · You should mange your waste properly in such places I have seen a drastic change in the panorama of the place near the bridge there is so much litter. I miss alot kasol and all my friends there. Hope to return soon.hard travel to arrive there but at the end you will find a piece of heaven. Very nice information dear, as a photographer now I will visit this place for sure.